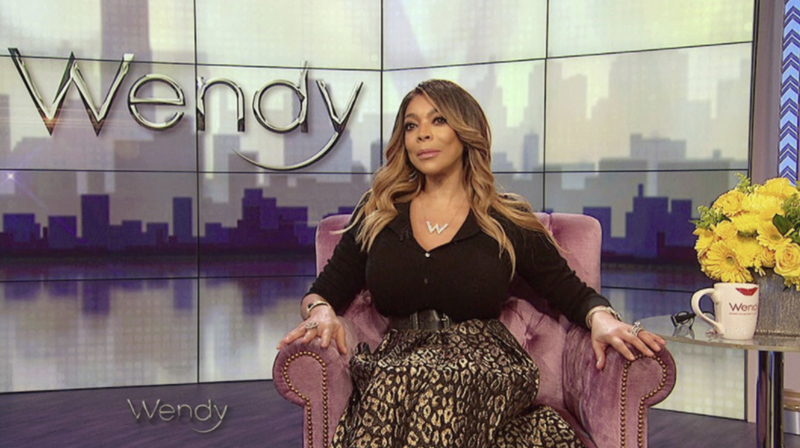 On Thursday Wendy Williams was spotted in public with her husband Kevin Hunter for the first time since news broke that his longtime mistress Sharina Hudson had given birth to his baby [click here if you missed that]. Wendy and her husband were peppered with questions about the baby on Thursday and Wendy's eyes were blazing as she spoke sternly to Kevin in clear view of the photogs after they entered the building. On Friday Wendy was spotted in New York with an assistant and made sure to let the paps see her bare ring finger. Thank God Wendy is finally waking up! Don't break out the balloons just yet. Wendy Oya is rolling through you life right now with the tornado of change, the universe is also waking you up to the reality your tumor headed huzzband, story has wrapped up in your life, time to close that sad disrespectful chapter. The universe is speaking Wendy are you listening? because the next step if you stay in this toxic relationship is your body being riddled with a debilitating illness like breast cancer of a stroke, the negative energy you have been holding onto must go somewhere, the escape of drugs and alcohol will not work, you are being confronted with your own insecurities and issues of self worth. You are going to either evolve or die. Wendy just playing games with the media with that ring. A sick game. Just like Jussie, this ish has gotten stale and old. It's just pathetic at this point. Something tells me she likes being Hot Topic. It's probably the most attention she has ever received because Kevin doesn't give it to her.